Believe it or not, we are finally seeing the end of winter and beginnings of spring here in southeast Idaho. Within the next few weeks, the 2018 spring senior girls from Pocatello, Fort Hall, Blackfoot and Idaho Falls high schools will be booking their senior sessions. Right after that the 2019 classes will be scheduling their summer sessions. For a lot of girls, other than their selfies, their senior sessions will be their first photo shoot. I get a lot of questions on what to wear, how to do their hair and makeup and so on and so on... Today I will give senior girls and their moms four tips about their eyes to make sure their senior session at Moz Studios is the very best it can be! One of the things I tell all my seniors, is no matter how old they get, their parents will always see them as little kids. What we know moms and dads love the most about their kids, are their beautiful little faces. Because we shoot so many close up images at your session, you want to make sure the night before your shoot you get some good rest. If you are up too late, or have too much fun the night before it will absolutely show in your eyes at your shoot. You do not want to come to your session with tired or red eyes because it will show in your images. There are a few things that work in the real world that do not work in the photography world. One of those are giant fake eye lashes. Really big lashes look fantastic when you are on a date, at prom or just hanging with your girls, but they are one of the WORST ideas for your senior session. The problem is, the lashes literally work as window shades to your eyes. The light cannot get past the lashes and instead of your eyes being bright and full of life they end up dark and moody. What is even worse is when you do get light past the lashes and they leave black shadow lines on the whites of your eyes. If you are going to use fake lashes for your session, I HIGHLY recommend using medium size ones. They will still look great without the issues of the long ones. One of the other things I see shooting high school seniors is girls who have been a little too heavy handed with their mascara. It's not a huge deal when we are shooting images from a distance, but when I move in for those close shots, all that mascara becomes a real problem. The biggest issue with clumpy mascara is it looks sloppy and is very distracting because you have stuck together lashes that makes weird gaps and at the ends of the lashes are big clumps of makeup. Mascara is like Sriracha! Its there to enhance, but if you put too much on it completely takes over and ruins the dish; less is more for sure! 4. All that glitters IS NOT GOLD! My last tip is about the kind of makeup you use on your eyes. A lot of girls have their makeup done by professional makeup artists before their shoot or they try to copy a look they have seen on the internet. Both options are awesome, but keep in mind if you use shimmery makeup or makeup with glitter, the shimmer or the glitter more times than not look will look like white specks in your images and not shinny. The reason the makeup pops in the real world is because its reflecting light and because you are moving. In still images when the light hits and reflects, it just reflects white. Once again just keep in mind some things looks really great in the real world and not so much in photos! There are a few tips, whether you are a high school senior from Pocatello, Fort Hall, Blackfoot or Idaho Falls to think about that will make your senior session as BADASS as it can possibly be! Click on the link below to see some more of our BADASS senior images and to schedule your session! Photographer Craig La Mere of Moz Studios specializes in Seniors, Family, Weddings, Glamour, Boudoir & Commercial Photography sessions. With a studio location in Chubbuck, ID, Craig serves the Pocatello, Blackfoot, Idaho Falls, area. Craig has been a professional photographer for 10 years. 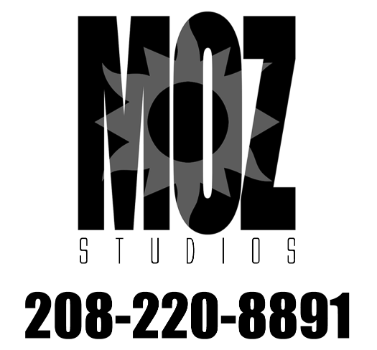 Our goal at Moz Studios is very simple: Show our clients a good time and create images they absolutely love. Adrienne - These are great tips! Thanks for the helpful info.